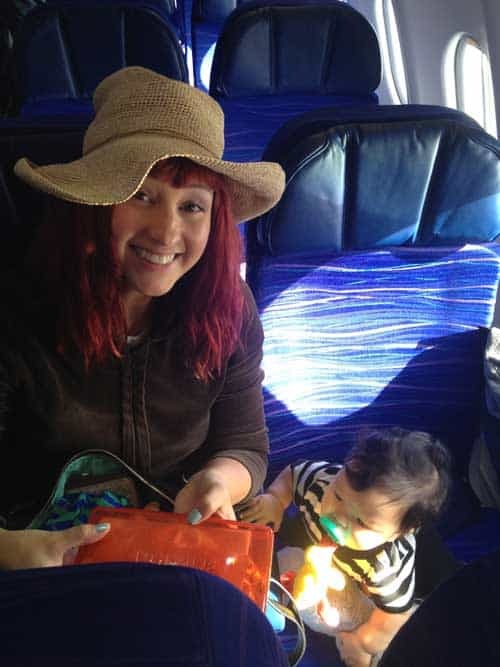 Flying with a baby (or a baby bump) is an adventure, but we are travelers at heart and we were raised by parents who traveled with their kids (us), so we weren’t going to let our growing family stand in the way of any opportunity to hop on a plane. And, though adding another person means lugging additional baggage which we are now forced to check rather than carry-on, surprisingly not much about our travel traditions has changed. That said, after looking at our upcoming travel schedule for the early part of summer we feared we may have bit off more than we could chew. We had a total of four trips and ten flights scheduled over the course of three months (including three trips that were back-to-back, two of which had three hour time changes to deal with). To add another number to the mix, our son would be just five months old at the time of his first flight. Our first trip took us to Portland, OR which is about 2.5 hours from LA and a great starter flight. Our next trip was to Tucson which was a short flight be we upped the difficulty level by also bringing our dog (honestly, are we crazy?) who travels well and stayed comfortably in her carrier under the seat for the duration of the flight and didn’t make a peep. The last two trips were biggies. New York and Hawaii. We’re happy to report that all of the flights went well and despite a few moments of uncertainty (it’s amazing how being confined to a tiny space next to a complete stranger magnifies your baby’s volume, crying and cooing alike) for the most part, our son slept peacefully and happily engaged in the various activities we armed ourselves with. So, as parents who started off with zero experience traveling with a little one but who had plenty of experience standing in line at security behind other people’s fussy kids and seated next to babies who seemed to cry without respite for twelve hours straight, we’d like to share a few tips that have worked well for us thus far. We’ve included some suggestions from friends who have older babies as well and we would love for all you frequent fliers out there to chime in with your personal tips too! A happy baby means a happy flight for everyone. Having a baby means having to check baggage, so take advantage of it and bring the monitor and swaddle blanket and stuffed “lovie” if you want, but keep the number of bags to a minimum and stash diapers wherever a little extra space is available. You can roll them up and stuff them into the toe-box of your favorite Louboutins or converse and you can use them to pad your chunky bangles and necklaces. Packing healthful snacks is a must, for adults and babies alike, and remember that with a baby, you are allowed to carry-on bottles of water, formula and breast milk. Window seats are ideal as some babies love looking outside. It also adds more privacy during feeding times. Scoring a seat toward the front of the place is a bonus as you will be able to deplane earlier. Always check with your airline to confirm their specific rules for traveling with a lap child and be sure to bring a copy of your baby’s birth certificate to prove his age if needed. Remember on most airlines a baby can fly free if they are under two years of age and sit on your lap. Every airline is slightly different, so again, check with your carrier to confirm their policies regarding car seats and strollers, but when possible we recommend wearing your baby in baby carrier through security, checking your car seat in a large duffel bag (sneak some diapers in there) and using your stroller base to help schlep carry-on bags to the gate. In most cases you can check your stroller at the jet-way and it will be waiting for your when you deplane. If you have an extra seat next to you, use it as an overflow area for toys, snacks and gear and let your baby sit, play, stand or lay down there. Bringing a car seat on board an already tight plane will just cramp you even more. If you opt to wear your child through security you will save a good amount of time and hassle. Simply place your stuff on the x-ray belt as usual stroll through the detector with your baby in her carrier. You will be asked to step aside for additional screening which consists of a TSA agent wiping your hands with a cloth to test for explosives. It takes no more than two minutes. If you have chosen to bring water, formula or breast milk it’s best to take it out of your bag and tell the agent what it is. They will then put it through a machine to confirm its safety and you are good to go. We highly recommend going through the process of getting TSA Precheck. Our family has Global Entry which means we can use the TSA Precheck lines at the security gates and we have expedited lines at customs. Clean diapers make for more comfortable babies, so find a spot in the corner and try to avoid in-flight changes. 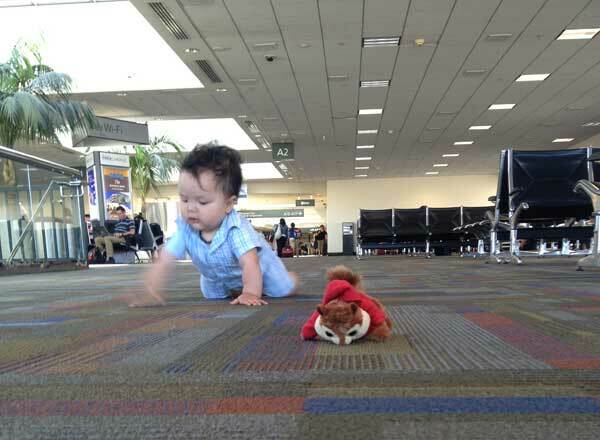 If your baby is crawling or walking it’s a good idea to give him free range at the gate while waiting to board. Encourage him to work out his energy and enjoy the last few minutes of physical activity in an open space before transitioning to calm, mental exercises on board. I’ve never been one to board a plane early (I don’t understand wanting to sit in a cramped space any longer than is absolutely necessary) but with a baby, early boarding is a good thing so get on and get organized. 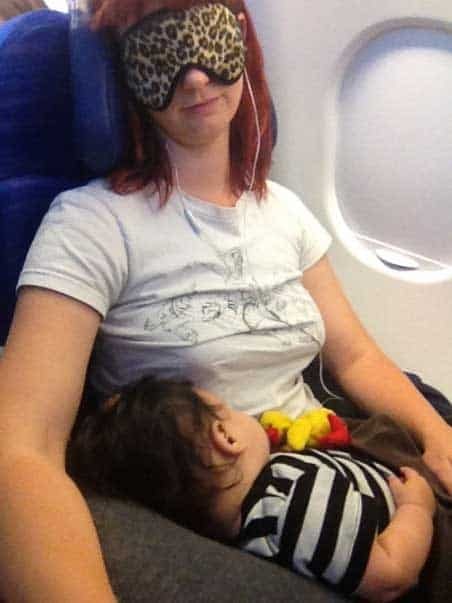 Make Nice – Endearing yourself and your baby to fellow passengers and flight attendants before you get in the air and while your baby is in a good mood is a nice ice-breaker and it will almost always encourage their kindness and make them more willing to rally behind you if your little one causes a fuss. I found that holding Hunter facing outward as we enter the plane and giving him a few inconspicuous tickles so passengers think his huge gummy smile was solely for them worked like magic. The Right Amount of Stimulation – Our son doesn’t watch TV nor does he engage with an iPad or iPhone. This won’t last forever but we are trying to hold out as long as possible. We thought if there was ever a time to let him zone out by watching TV a six hour flight would be it, but he just wasn’t interested. On a side note, the day before our return flight from Hawaii a father and son had been asked to leave a flight after the plane had already left the gate because the three year old boy threw a fit when he was asked to turn off his iPad. Avoid this altogether by leaving the iPad at home, or in mommy’s bag stored above, and prepare for other rich in-flight activities. Surprises – Don’t pull all the toys in your arsenal out at once. Rather reveal them one-by-one while turning each into a little surprise. Our friend Alix suggested pipe cleaners to inspire endless creativity and puffy stickers that can be stuck on seats and tray-backs and then peeled off keeping little fingers busy for hours. Naps – Timing naps for a flight isn’t always feasible but when it works out it’s a dream. Keeping your child on a similar schedule while you travel is important but letting him sleep during check-in and at the gate might not be the best idea if you want him to sleep on the plane. Obviously well rested children behave better so don’t deprive them of sleep but if you can encourage them to enjoy their surroundings at the airport (which will be exhausting) then you are likely to have a sleepy baby once you get on board. Feeding – We are breastfeeding but if you are bottle feeding the same applies. Encourage your baby to eat on the ascent and descent as this equalizes the pressure in their ears. Some babies are very sensitive to changes in pressure and will let you know if they are in pain in a not so subtle way. Drinking water out of a sippy cup or sucking on a pacifier can serve the same purpose. Relax – Flying can be stressful enough and adding an infant to the mix can amp up your anxiety to levels never before experienced. Keep in mind that your baby can sense this and will innately match your energy, good or bad, so the best thing you can do is to summon your inner yogi, take some deep breaths and remain calm. “This too will pass.” Unless the seat belt sign is on, get up and walk with your baby or even just stand and hold her for awhile in the galley area. Most flight attendants are fine with this and are happy to take a moment out of their work-day to engage with a cute baby. We’ve even had attendants offer to hold our son and show him around their workstation. As with life there are good days and bad days and the same goes for travel. Take it all in stride and celebrate each victory, no matter how small, brush off the setbacks and keep on traveling. Bon Voyage! Please share this with your friends and family who will be traveling with a little one and if you’ve got your own tips to share please leave them in the comments. If you are a parent to a little one you might also enjoy these other articles.